These gorgeous holiday cards feature a golden Christmas tree upon them! The festive tree has been decorated with jewels and baubles, and strings of pearls. 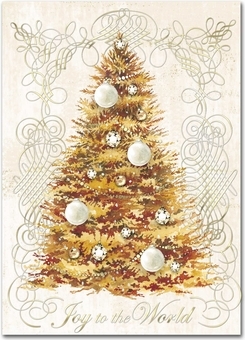 Around the tree are ornate swirl designs, and underneath has been written "Joy to the World". The card shimmers with gems and gold foil!